The Linksys Max-Stream AC1900 is an excellent wireless router for most users due to the combination of excellent value, decent performance, and an aesthetic that won’t seem out of place in your home. For most households, the best router is going to be one that lets them stream Netflix on multiple devices without any interruptions. That’s tough for more affordable single or dual-band routers to handle, meaning you’ll usually need to splash out for a more expensive option. Fortunately, the Max-Stream AC1900 from Linksys is a value-oriented router that will let everyone in your home watch their favorite shows simultaneously and without buffering. We spent over a week testing the router in a home environment, see how it fared in standard browsing, streaming, and gaming with multiple devices. These days, a lot of wireless routers are coming around with modern designs that make you want to show them off, rather than hiding them behind some fern. Conversely, there are a lot of gaming routers with aggressive red accents for the “gaming” aesthetic. So, when we opened up the Linksys Max-Stream AC1900 and saw that it was simply a black piece of plastic with no notable design flourishes, we were taken aback. The Max-Stream AC1900 is arguably the best value in the wireless router market right now. Don’t take that as critique, though — this design will help it blend into the background. Nobody wants a router so ugly it needs to be hidden, so we appreciate that the Linksys Max-Stream AC1900 is basically inoffensive. This router is completely black, and instead of having a bunch of status LEDs, the Linksys logo is the only element that’s illuminated on the front. Instead, the LEDs that would indicate any problems are located around the back, where they won’t draw your eye. That might end up being a double-edged sword if problems arise, but we appreciate the focus on an inconspicuous design. Our favorite routers are the ones that you can set up in a few minutes, without having to dig through obtrusive menus or fiddling with your modem too much. The Linksys Max-Stream AC1900, thankfully, is a breeze to set up. First, plug it into the wall, then to your modem, and wait for the light to turn on. Once it’s powered on you can connect to the network address listed in the manual and follow the on-screen instructions to set-up your network. If you don’t want to use the web portal, after the initial setup you can download the mobile app use, login using your account details, and manage the network from your phone. Whether you’re running off DSL or a speedy 250Mbps Xfinity package like we were, you shouldn’t run into any issues setting the Max-Stream AC1900 up. 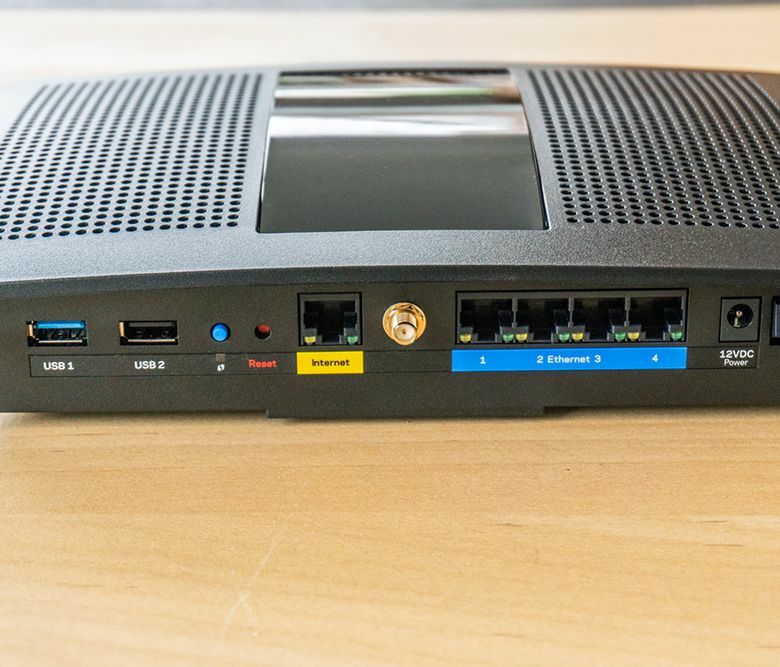 Anyone that’s looking for a router focused on streaming media is going to be less focused on hard-wired connections, but the Linksys Max-Stream AC1900 has more than enough ethernet ports to get the job done with four Gigabit LAN ports on the back, and two USB ports — one USB 3.0 and one USB 2.0 for connecting network-attached storage. This isn’t a wealth of connectivity by any means, but the Max-Stream makes up for it with its focus on solid wireless performance. The router does what it sets out to do — provides an excellent streaming experience at a mid-range price. With three antennas and MU-MIMO technology (or, multi-user, multiple input, multiple output) that allows it to handle streaming to multiple devices, the Linksys Max-Stream AC1900 packs reliable wireless connectivity, even if it’s not the fastest on the market. With a mid-range router like the Linksys Max-Stream AC1900, we weren’t expecting a ton of cutting edge features and software, but that doesn’t mean that it’s completely lacking, either. The network portal may be spartan, but it’s still user-friendly. All of the settings you’ll need to access regularly are conveniently laid out on the homepage in the form widgets, allowing you to quickly adjust them, or simply check their status. You can also download the Linksys app on iOS or Android, which will basically give you a mobile-friendly version of the router back-end letting you make adjustments to your network from the living room couch. We’ve already mentioned a few times that this is a router focused on streaming, and there’s one core feature that really drives that focus home. From the router’s homepage (or the mobile app), you can prioritize different devices. You can also prioritize certain apps and games, but you’ll have to manually add them if they’ve been released in this decade. This was difficult to actually test with our ISP, as we have enough bandwidth to stream high-resolution video on multiple devices, but if you’re running a slower web connection, this feature will prioritize your living room smart TV or streaming box, so your Netflix binge isn’t interrupted by your roommate downloading a new game in the other room. If we were to choose two words to describe the Linksys Max-Stream AC1900’s performance, they’d have to be “good enough”. While it’s not going to hold your network back, by any means, we noticed some fluctuations in network performance. In testing the Linksys Max-Stream AC1900, we carried an iPad around our house, running the Ookla Speed Test app in different parts of our home to see how the network performed. And, while we were able to get the speeds we’re paying our ISP for, we noticed some fluctuations in the network speed during each test. Basically, it’d kick off around 85Mbps, and eventually reach 250Mbps over the course of the 10-second test. This likely won’t be a huge deal for most users, but anyone that needs a steady download speed should be aware. However, every other aspect of the router performed admirably. Not only were we able to get solid connection throughout our 2,000 square foot home, but the MU-MIMO technology worked wonders allowing to stream Netflix on several computers, tablets and phones at the same time. The Linksys Max-Stream AC1900 handled it without breaking a sweat. The router does what it sets out to do — provides an excellent streaming experience at a mid-range price. It’s not the most premium router out there, but it’s not trying to be. If you’re just looking for a router that will let everyone in your household stream without slowing each other down, you really can’t go wrong here. The Linksys Max-Stream AC1900 will set you back $159.00 (retail price), which feels like the perfect price point. It’s a mid-range price for a mid-range router, and you’ll have a hard time finding a better streaming-oriented router at a similar price — especially one that has MU-MIMO compatibility. You’ll have a hard time finding a MU-MIMO compatible router for less. Now, you can probably find plenty of cheaper routers out there, but we wouldn’t advise these options if you live in a household with more than one person. As far as we’re concerned, the Max-Stream AC1900 is arguably the best value in the wireless router market right now for streaming-oriented multi-device households. The Linksys Max-Stream AC1900 might be one of the most affordable MU-MIMO routers out there, but if you can pony up an extra $40 you can pick up the Netgear Nighthawk AC2300. That might sound like a lot of cash, but you’re getting all the features that the Linksys router offers, but with faster AC2300 speeds and more software features. If you’re already paying the premium for fast broadband speeds, the extra cash is worth it. However, if you don’t have the fastest internet out there, the Linksys Max-Stream AC1900 is really all you need. Again, you’ll have a hard time finding a MU-MIMO compatible router for less. Take a look at other product reviews and shop for the best wireless routers available online. If you don’t need the fastest wireless router on the market, and you’re just looking for something that’ll let you and your family stream without interruptions, you can’t really go wrong with the Linksys Max-Stream AC1900. It’s high-end enough that the average user won’t run into any noticeable slowdowns, at a price that won’t make your wallet cry. As far as mid-range routers go, Linksys nailed it with the Max-Stream AC1900. Product Dimensions 10.12 x 7.24 x 2.2 in.